For carpenters, plumbers, craftsmen, and even contractors, the hacksaw is a must-have and largely indispensable tool. It is a handy tool for cutting or sawing different materials on the construction site and even at home. The vast majority of high quality hacksaws spot a sturdy metal frame and a similarly durable, fine-toothed blade that can withstand the demands of cutting abrasive metals, plastics and even the bulkiest stocks of wood. Though there are different types on the market, most hacksaws come with 12-inch or 10-inch blades. Less popular variations have smaller blades measuring some 6 inches and even though they are diminutive, they are the most suited for slicing through plastic tubing and metal pipes. They are additionally perfect for giving your material a neat finish and for precise cutting. Plus, they are considerably cheaper and easy to use when trying to cut materials in tight or hard-to-reach spots. Expectedly, various users have different cutting needs, meaning that no particular hacksaw is the absolute best. Your search should therefore focus on finding the most suitable, and not the best, hacksaw on the market. Effectively doing so, however, would require that you first understand your cutting needs and the features your preferred choice should spot. You can use these expectations as a benchmark for comparing different models from different brands, narrowing and refining your focus progressively until you find your perfect match. Patently, that’s going to be a laborious and onerous undertaking, which is why we’ve gone to the trouble of compiling a list of featuring the best hacksaws on the market currently. But first, let’s take a look at the vital features to keep in mind while shopping for the best/most suitable hacksaw. The DeWalt brand is one of those brands that need little or no introduction at all unless of course, you're a greenhorn. In which case we won't waste a minute to introduce you to the awesome brand that's DeWalt. For one, it's a brand whose products have increasingly become synonymous with high-quality production, longevity, and exceptional performance. 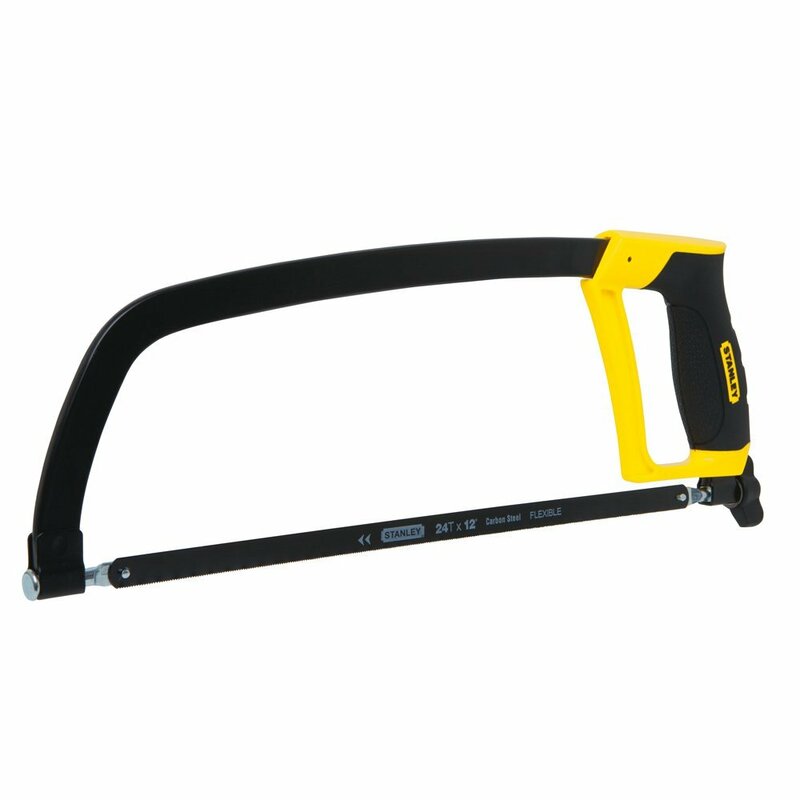 One of their flagship products for the home improvement and innovation industry is the DeWalt DWHT20547L 5-in-1 Hacksaw. It comes with all the bells and whistles you’d expect from a top-end hacksaw. Continue reading for a quick yet thorough review of the outstanding features of the hacksaw. As you would also expect, using it is a cinch. The machine comes with a high tension blade that you can quickly and easily tension to a maximum of 330 pounds, consequently allowing you to effortlessly and accurately cut through a wide range of abrasive materials like steel without it wobbling. The hacksaw similarly accords you a strong cut that significantly minimizes the chances of it snapping while in the middle of an operation, as would cheap, off-brand models. Another unique selling point is the pivoting capability of the blade. Because the blade is capable of pivoting between 45 and 90 degrees, you can easily undertake flush cuts. The design is both effort and time-saving as it spares you the frustration of having to change saws every time. The construction of the hacksaw is commensurate with its performance expectations. The frame is both lightweight and compact, which conforms to the construction expectations of a handheld tool. The diminutive profile provides for easy access and unhindered access to tight and awkward spaces with you having to strain at all. The rugged and industrial-grade construction of the hacksaw using only high-quality materials makes it ideal for undertaking heavy-duty projects around the workshop, as it withstands wear and tear pretty strongly. The expert and professional design and construction makes it both practical and easy to use. The blade, for instance, attaches to the very front of the hacksaw’s frame, you get to enjoy a longer reach that’s particularly helpful for users working in constricted spaces. 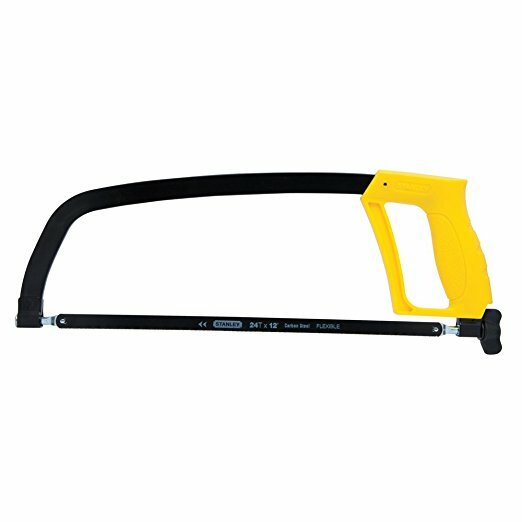 You can also quickly convert the hacksaw into an ergonomically designed jab saw for undertaking special projects by adjusting the front handle. Whether you’ll be using it primarily as a hacksaw and as a jab saw on occasion or not, there’s no denying that the DeWalt DWHT20547L is quite easy to use. With a weight of less than 2.5 pounds and a rubberized handle, you can use it for hours on end before you start experiencing any significant hand fatigue or straining your shoulder muscles. The high-quality construction makes it an ideal tool for use by enthusiastic DIYers, the weekend warrior, and even seasoned craftsmen. It has several unique features that make short work of cutting metals, plastics and even pieces of wood into different sizes. Also, since it combines five important functions into one, your tool box will be less cluttered, meaning that it's an economical choice compared to buying all the five tools separately. All products from the DeWalt brand have a reputation for being durable, easy to use, powerful, and very versatile, and the DeWalt DWHT20547L is no different. The hand tool espouses all these qualities and so much more in a lightweight and compact package that's both versatile and affordable. The sturdy and durable construction is perfect for handling all projects, and the gentle learning curve is perfect for novices. If you want value for your money, your best bet would be this awesome product from Dewalt. 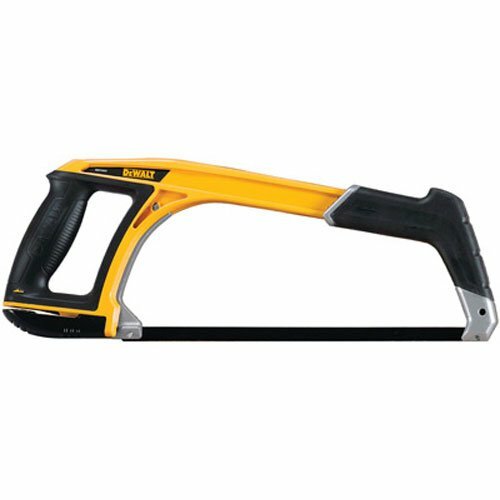 The Klein Tools is yet another customer-trusted and highly reputed brand in the hacksaw industry, making some of the best hacksaws for home improvement and renovation. One of their best creations, the Klein Tools 702-12 Hacksaw with 12-Inch Blade and 6-Inch Reciprocating Blade, for instance, has a commanding and stodgy feeling in the hand. 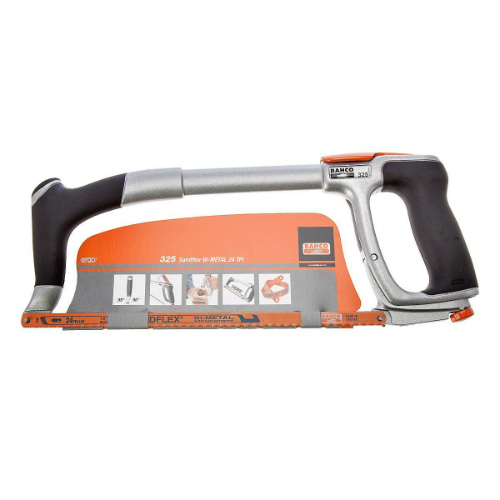 It is a versatile tool that combines the functions of two saws in one and features an impressive and high-performing 24 tooth per inch 12-inch hacksaws blade. With so many teeth to work with, the blade powers effortlessly and quickly through a wide range of materials, from the toughest metals to light plastics. Greater performance and ease of use is facilitated by the inclusion of a 6-inch reciprocating blade with 24 teeth per inch (TPI). Its design and engineering make it an ideal tool for bi-metal cutting, especially in awkward and hard-to-reach spots. Lastly, the construction of the handle using industrial-grade aluminium and the inclusion of a soft grip handle goes a long way in ensuring ease of use and comfortable and confident handling of different materials. That's admittedly a long overview, but it comprehensively covers all the vital facets of the Klein Tools 702-12 Hacksaw with 12-Inch Blade and 6-Inch Reciprocating Blade that we’ll be looking at in detail in the subsequent paragraphs. The performance is quite exceptional, as one would expect from a hacksaw of its calibre. Like the previous product, the user has the freedom of adjusting the blade tension to a maximum of 30,000 PSI, necessary for achieving the high-quality, precise and fast cuts for which professional craftsmen are most famous. Once you get the tension right, you also won’t have to worry about the blade wobbling or being unstable in a way that could lead to an expensive mistake or error. Like we mentioned in the introductory paragraph, it is a versatile tool and which handle multiple materials with relative ease and speed. It combines the functions of both a hacksaw and reciprocating blade which is made possible following the innovative design of the front mount that's capable of accommodating the reciprocating saw blade. While the reciprocating blade comes with a length of 6 inches, the bi-metal blade specifically meant for hacksaw projects has a length of 12 inches. Together, the two make short and quick work of cutting through a wide array of tough and light materials without the slightest hesitation. It features one of the highest construction qualities on the market. It is built to last for several years on end with some proper care and occasional maintenance. The durability implies that it can withstand wear and tear pretty well over the years. Also, it has rubber handles on both sides to encourage a two-handed operation for those who’ll be working with tough materials like steel. The grips are rubberized and therefore comfortable and sufficiently fitting to hold for long hours on end. Off-brand and traditional hacksaws of yesteryears are difficult to use in making flush cuts, particularly where generous space is lacking. That’s however not the case with the Klein Tools 702-12. It offers the user an optional 45-degree mounting that ensures greater versatility for easily, quickly and effortlessly making flush cuts. Put all of these premium features together, and you begin to understand why the hacksaw is the go-to tool for the vast majority of craftsmen, carpenters, and contractors working with metals, plastics, and wood. The unit clearly takes the effort and time out of the cutting activities, while ensuring your end product has a high-quality and smooth finish and also precise. Such exceptional performance and ease of use quickly justify the product's premium pricing, too. 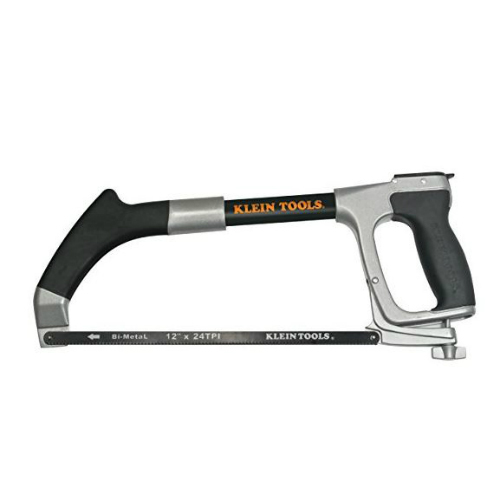 To conclude, the professional design and engineering of the Klein Tools 702-12 clearly targets the professional and seasoned Do-It-Yourselfers out there, those who have mastered their way around hand tools. The hacksaw offers the user a bunch of useful effort and time-saving features while remaining surprisingly easy to use. While it’s not suitable for greenhorns, the learning curve is gentle enough to accommodate those who are brave enough to begin with a high-end machine. For professional craftsmen and enthusiastic DIYers in search of the ultimate performance, practicality, and ease of use, take a thorough look at the Bahco 325. The hand tool packs all the features you need and so much more in a lightweight and compact frame. While the brand may not as easily recognizable as say, DeWalt and Klein Tools, the engineers at Bahco sure know their craft, seeing as the performance of the hacksaw closely rivals the best from the two brands. The perfect balancing of the hacksaw makes it easy and quick to use and helps reduce cutting time by a significant percentage. Now let's take an in-depth look at the hacksaw to reveal the features that make it stand out. Right off the bat, we’ll mention that it is a cinch to use. Like the previous product, the hacksaw comes with two grips, both featuring an ergonomic design and a soft rubberized grip to increase ease of use and comfort. As a result, other than filling up your hands perfectly to minimize slippage in the middle of an operation, the design also reduces hand fatigue and strain occasioned by cutting abrasive materials such as steel for long periods. To further augment ease of use, the frame is lightweight and compact, providing for perfect manoeuvrability and controllability when working in tight and hard-to-reach spots. It spots an easy-to-use knob for quickly and effortlessly adjusting blade tension depending on the material you intend to cut. For tough materials like metals, high blade tension is necessary, so the cut is as accurate, straight and as exact as possible. The thoughtful design of the hacksaw allows for a two-handed operation by including two ergonomic handles all of which ensure the even distribution of pressure to the palm for a forceful but accurate and precise sawing. The grips are both soft and have high-friction surfaces to minimize slippage while enhancing comfort. Some of the performance features that makes it very easy to use include the centre blade, spring tensioned blade loading mechanism and the alternative blade mounting mechanism. The centre blade is necessary for ensuring the proper and perfect balancing of the whole unit while the spring tensioned blade loading mechanism takes the effort and time from the otherwise cumbersome and labour-intensive process of adjusting the tension of the blade. The 55-degree blade mounting feature. On the other hand, is ideal for flush cutting. Combine all these features with the reliable and durable bi-metal blade 24 TPI, and you have yourself a hacksaw that easily exceeds performance expectations. And that’s not all. In addition to the ergonomic handle, it has other features that make it easy to use. There is an adjusting screw just behind the blade for increasing tension on the blade. Contrary to your expectations, the screw is easy to twist, and its placement out of the way allows for quick access and use. The tensioning lever is built into the handle though, and the intention is so that it becomes easy to use and to avoid any possibilities of it pinching your fingers while working. Together, these features make the Bahco 325 one of the best and user-friendly hacksaws out there, and would, therefore, be ideal to users in need of hassle-free and trouble-free performance. If you deal with abrasive materials like steel most of the time, you need a hacksaw that won't cave after a few hours of use. You need something that's durable and professionally constructed to stand the test of time while providing you with the best performance. Those are shoes that off-brand hacksaws can never fill, except of course for the Bahco 325. The ergonomic design of the hacksaw together with its perfect balancing, comfortable rubberized handle, and exceptionally high blade tension for straight, accurate and fast cuts, and affordability easily makes it the perfect choice. With the hacksaw at your disposal, you'll never look back, and your sawing experience will never be the same. 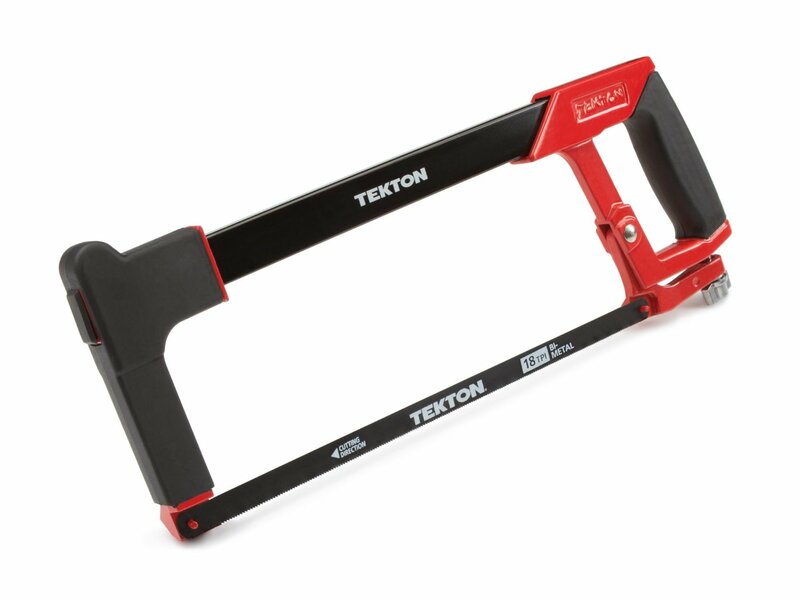 As per our tradition in this brief, we’ll begin by giving you a quick overview of the instrumental features of the Tekton 6823 2-in-1 High-Tension Hacksaw before plunging into an in-depth analysis. Among the numerous unique selling points of the hacksaw, the one that stands out from the very onset is the high-quality construction. The use of steel makes the hacksaw capable of taking a beating or withstanding abuse resulting from cutting some of the toughest and hardest materials the user can find. The high tensioned blade also guards against twisting or breakage when working and therefore guarantees accurate, fast, and precise cutting. As for ease of use, the Tekton 6823 is equipped with comfortable, non-slip handles and is both lightweight and compact. Is there anything we've inadvertently left out? Oh, yes. And the machine is quite affordable in spite of stocking all these premium features. Now let's jump to the technical details. As mentioned above, the rigid square construction immediately stands out when you first hold it in your hands. The use high-end tubular steel in the construction prevents the possibility of it twisting or breaking or bending out of shape when cutting through the sturdiest or toughest materials. It can, therefore, take a beating without you having to cringe your face fearing the worst. Throw steel, tough plastic or even the most abrasive wood pieces and the Tekton 6823 will comfortably and effortlessly power through them in a fraction of the time it would take cheaper or off-model brands. It comes with a sturdy blade measuring the conventional 12-inches and capable of pivoting between 45 and 90 degrees. As a result, whether it’s just the usual sawing or if you have to make flush cuts at awkward angles or in tight positions, the flexible design has you covered. And on the off-chance that the one-side serrated blade loses its sharpness, you can take advantage of the hacksaw’s nifty little feature to spare yourself the frustration of having to look for additional blades. There is special concealed compartment on the main beam of the frame where the user can conveniently keep additional blades, up to six of them. Whenever your blade loses its sharp edge, simply retreat to the compartment for a new blade. The feature is a time-saver considering a blade’s edge dulls a lot quicker under heavy use. Yet another feature that makes it a worthwhile consideration is the ease of using it, thanks to its ergonomic construction. Every nook and cranny of the hacksaw is crammed with convenience features to give the user the best cutting or sawing experience. The handles, for instance, are rubberized and have a non-slip grip to increase traction, so the machine does not accidentally slip from your grasp while working. A firm and secure grip provide for quick, easy, precise and accurate cutting. For a machine with such premium or high-end features, the normal expectation would be a commensurately high price. Instead, it remains low cost and is a solid choice for professional craftsmen and extreme Do-It-Yourselfers out there. Any plumbing or construction project will inevitably involve incessant heavy-duty straight and flush cutting. Without the right hacksaw, the application can quickly prove to be an onerous and time-consuming undertaking. Fortunately, it comes armed to the teeth. The rugged construction using industrial-grade aluminium alloy allow the machine to stand to heavy use. The non-slip handles augment usability and practicality while the sturdy frame guards against twisting and chattering. Plus, you have the discretion of adjusting blade tension to a remarkable 400 pounds for trouble-free, quick, and accurate cutting. Consumers tend to construe low-cost products as being less productive and poor performing and less durable. One of the products that effectively and quickly debunks such misconceptions is the Stanley STHT 20138 Solid Frame High Tension Hacksaw. The machine has features that easily endears it to the vast majority of plumbers, contractors, carpenters, electricians, and DIYers. The hacksaw carves its own path by spotting a durable blade that you can easily adjust to a range of 90 and 180 degrees, compared to the 45 and 90-degree range of most hacksaws. To this add ease of use, long-lasting construction, and affordability. With such a package, the Stanley STHT 20138 becomes highly irresistible, especially for users looking for a combination of value and performance. The fact that the blade is adjustable to within a range of 90 and 180 degrees is a critical feature. For one, it augments usability and saves the user a tremendous amount of effort and time during the cutting or sawing process. Secondly, and most importantly, it makes the otherwise onerous activity of flush cutting a cinch, especially considering that it comes with a sharp, one-sided 12-inch blade with a remarkable cutting depth of 4.375-inches. Moving forward, you’ll be able to get into tight and hard-to-reach spots with relative ease, providing you with ample space for cutting different materials accurately and quickly. Another instrumental feature is the use of metal in the construction of its frame. The result is a long-lasting, sturdy, and rugged machine that the user can confidently use to saw different materials, from tough steels to the softest plastics of woods. Couple the rugged frame with the industrial-grade blade with its exceptional edge retention and you have a machine you can use in different work conditions to quickly and precisely cut different materials. There is also a handy knob at the back for flush cutting and for quickly adjusting the tension on the blade in accordance with the hardness of the material you intend to cut. Like the rest of the product, it's ergonomically designed to make the manual adjustment effortless. The use of metal in the construction might erroneously give the user the impression that the hacksaw is stodgy and therefore difficult to control or manoeuvre. Contrary to such beliefs, it is both lightweight and compact and is built to provide the user with convenient, effortless and smooth use. Other than the slim design that allows for one-handed operation, it also minimizes hand strain and fatigue for users planning on sawing thick or tough materials for several hours at a time. Additionally, to ensure more comfort and ease of use, the handle features soft rubberized grip that is so effective they give the user the impression that the grip is a natural second layer of skin or a natural extension of their hands. You'll have to use it for a considerable amount of time before you start running the risk of hand fatigue or having blisters on your hands. To put everything in perspective, there is no denying that the Stanley STHT 20138 is a truly exceptional product. It is not uncommon to find contractors and builders doing their craft with the hacksaw firmly in their handy. Its construction is exceptional, and it's quite easy to use on different projects and in different settings. Adjusting the tension of the blade using the tension knob is fairly straightforward, a fact that considerably increases the product's effectiveness. It's a perfect choice for those who work mostly with dense or big blocks of wood, metal and even plastics. Naturally, contractors, carpenters, electricians, and other craftsmen undertake a wide array of tasks, meaning that they use several tools in the course of their work day. Switching from one tool to another is not only unproductive, but it's also time-wasting and somehow laborious. 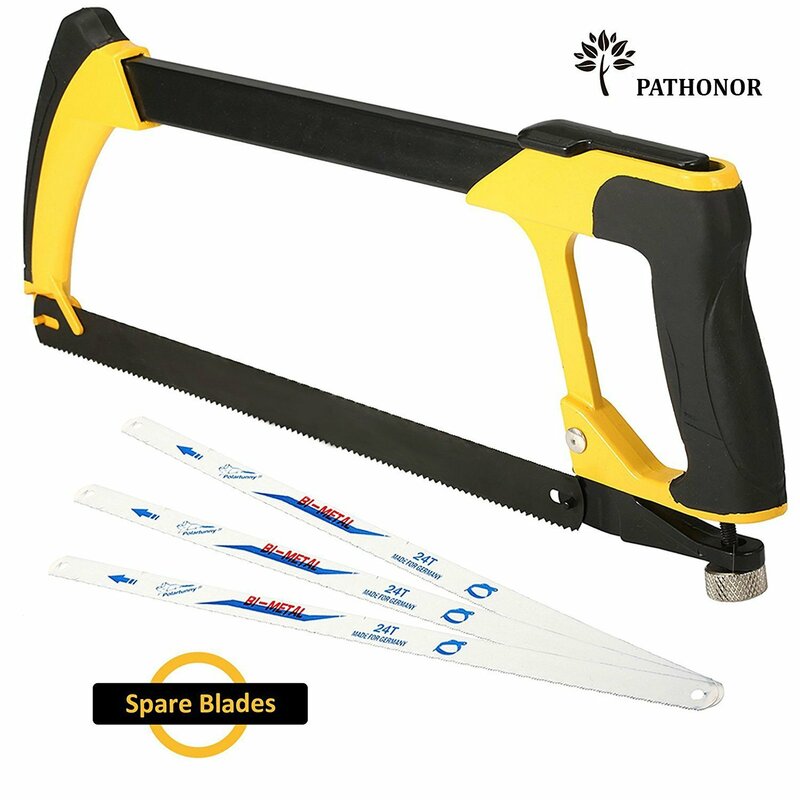 To solve this problem, the Pathonor brand provides its users with a multi-functional Magic Handsaws Set that effectively circumvents such difficulties by combining the functions of several tools into one. The result is an economical, affordable, easy to use and very flexible Pathonor Metal Handsaw Set. The tough blade eases the process of cutting through different materials, from woods, plastics, rubber, bamboo, rope, soft metal to stainless steel and so many more. The lightweight and compact characteristics of the Pathonor Metal Handsaw Set make it highly portable and easy to store at the end of a business day. The innovative design provides for easy and quick straight and flush cutting with a level of precise conspicuously lacking in rival hacksaws. Plus, it is very affordable. For this set to cut seamless and effortlessly through all kinds of different materials, it has to have a sturdy and durable blade. However, you get an additional three with each purchase. All the blades feature high-quality construction using the highest quality materials so they can provide a smooth and formidable performance when faced with such abrasive and tough materials like tiles, metal, and even steel. In the event that the blade you're using loses its sharp edge, you can easily swap it with one of the additional three, without having to take time off your busy schedule to go out in search of a replacement. And because they directly from the manufacturer, you have the much-needed quality assurance. The set is armed to the teeth with all the features and specs that will make short work of quickly and precisely cutting through the materials commonly used in a construction site such as wood, metals, and plastic. The model spots a double-sided 12-inch blade that easily slices through the materials mentioned above. The two sides of the blade are optimized for use with different materials. While one side performs optimally with wood, the other is explicitly meant for slicing through the more abrasive materials like plastic, steel, and brass, among others. Observing this distinction will not only ensure you end up with the best and most accurate results but also that the blade remains sharper for considerably longer. As is the case with all other hacksaws, the manufacturer highly recommends that you make a point of religiously checking the blade tension before getting started on your cutting or sawing project. This particular model is known for having an unstable trim nut that slides occasionally. Keeping an eye on it to ensure it does not slide goes a long way in preventing performance issues later on. Couple that with the easy to grip, the soft coating on the handles and you have yourself a handsaw you can use for hours on end with minimal fatigue. In all, the Pathonor set is a perfect handsaw for undertaking a wide range of cutting and sawing tasks around the workshop. Irrespective of the density or thickness of the wood, plastic, and metal objects on the construction site, the handsaws is capable of going through them in just a few minutes. The handle is thick and has a soft coating to make it easy to handle, control and manoeuvre when cutting through tough materials and trying to access tight and hard-to-reach spots while minimizing hand fatigue and straining. Users who want their money's worth would buy this set in a heartbeat. 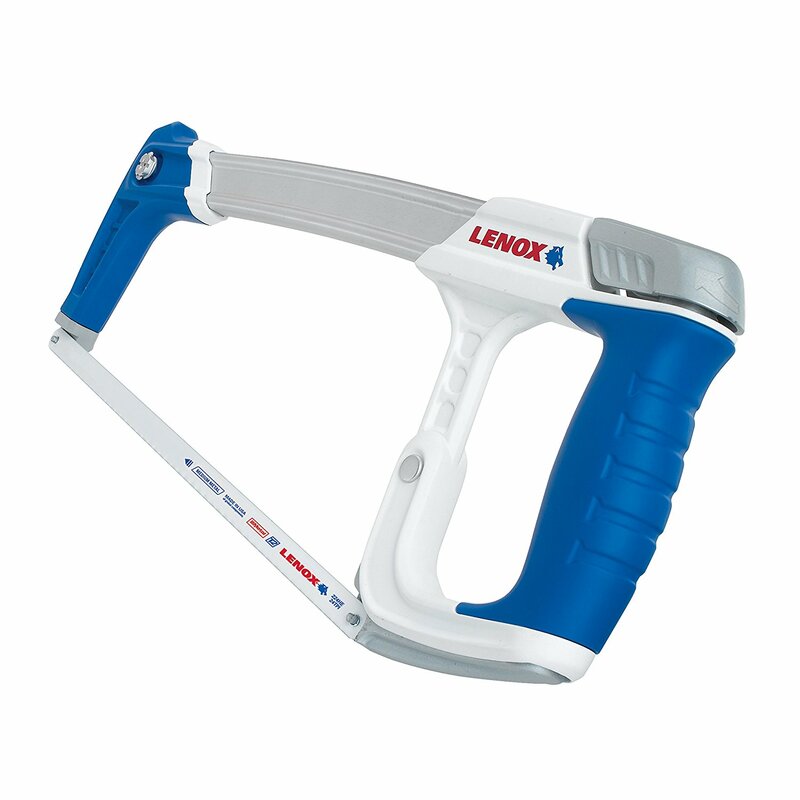 Cutting or sawing through different materials has never been easier, more fun, quick and accurate as it is with the LENOX Tools High-Tension Hacksaw. The hacksaw brings together all the features and specs that seasoned craftsmen insist on whenever they're buying a hacksaw. The frame is both lightweight and compact yet surprisingly sturdy and rugged, and there is a convenient spare blade holder for those times when you're handling particularly tough and hardened materials both at home and on the construction site. Couple the affordability and ease of using it and you have yourself one of the most flexible, rigid, and straight-cutting hacksaws on the face of God’s green planet. Plus, the design significantly enhances usability by featuring a comfortable fore and aft, as well as a soft, well rounded rubberized handle grip that minimizes hand straining and fatigue. If the overview above were to paint a picture, it would correctly give you the impression that the LENOX is patently on the best hacksaws on the market. The same applies to the quality of construction. For one, it features an I-beam construction that ensures it can handle heavy use in multiple settings and under different conditions. The industrial-grade construction also allows the user to increase tension on the blade to a maximum of 50,000 pounds per square inch, commonly abbreviated as PSI. At the highest blade tension, cutting through dense stocks of wood, plastic, and metal effectively becomes a breeze. Such tension levels also guarantee that you cut or sow accurately, quickly and effortlessly. There are literally no chances of you messing up a piece of expensive metal or wood because of a wobbly or unstable blade, as would be the case with off-brand hacksaw models flooding the market. At the maximum blade tension of 50,000 PSI, users can understandably be worried about the ease of using it. However, the good news is like all other hacksaws featuring on this list, using the hacksaw is actually a cinch. 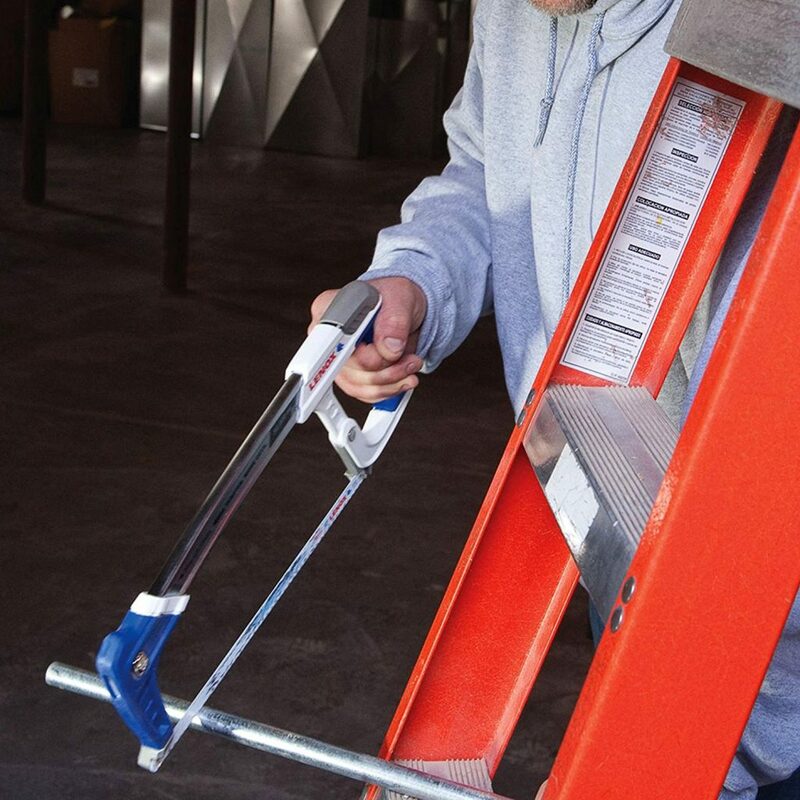 You won't break a sweat or strain your hands using the hacksaw. The machine is lightweight and compact to fit perfectly into most adult hands. Additionally, the hacksaw comes with two handles, one on each end, to provide the user with a two-handed operation necessary for exerting more force when handling tough materials like steel or metal. Also, they increase your grip on the handle even when the rains are pounding, although in all honesty, who cuts metals, woods, and plastics when it's raining? The versatility of the hacksaw is yet another feature that makes it hugely appealing to most users for cutting or sawing wood, plastic, and metals. The machine is compatible with a wide range of reciprocating blades from the Lenox brand, meaning converting the hacksaw to a jab saw is also easy and straightforward. The handle has a storage compartment where you can keep as much as five backup blades for future use when the current one loses its sharp cutting edge. Rather than shelving your project to look for a replacement blade, you simply swap the dull one with one of those in the compartment, and you'll be back to sawing in no time at all. For users working on a budget and need a taste of premium features, look no further than the LENOX. With skilled hands and the machine in your hands, you’ll make short work, accurate, and quick work of sawing different materials. The comfortable and soft handles enhance ease of use and practicality while the rigid construction allows it to withstand the wear and tear occasioned by cutting through abrasive materials and generating high temperatures in the process. For all your cutting and sawing needs, you can confidently count on this option. Different people look for different things in a hacksaw, and these variations in tastes and preferences are mostly driven by the nature of the tasks at hand. If you're out here in search of speed and accuracy, we're more than glad to introduce you to one of the most formidable hacksaws in the industry: the Park Tool 12-Inch Hacksaw. Despite coming seventh on the list, the performance of the hacksaw easily beats that of other top-model variants on the market. Aside from the undisputable performance, the machine also comes with aesthetically appealing looks and will be a good addition to your growing collection of indispensable tools. With just a few improvements here and there, we don't see any reason as to why the Park Tool 12-Inch Hacksaw can't shoot to the top of the list of best hacksaws on the market today. 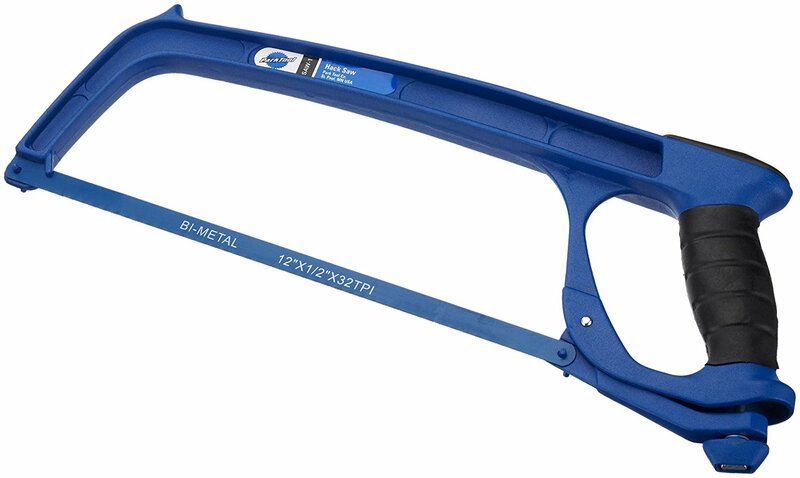 Judging by physical appearances, it looks like any other hacksaw you'd find on the market, though it’s blue colour is admittedly attractive for a hacksaw. Delving a little deeper into the features and specs of the hacksaw, however, reveals a whole different story. The construction of the machine, to begin with, is top-notch. The manufacturer clearly understands the vagaries of the construction industry and tries to create a perfect balance between performance and durability and ease of use. The use of aluminium die cast in the construction of the machine comes with several advantages, the most obvious being longevity. The blade can take some significant beating in the busiest construction industry without giving the slightest indication of wear and tear. The sturdy bi-metal blade features the same construction quality and will provide for a smooth performance with different materials. In addition to increasing the lifespan of this hacksaw, the use of aluminium die-cast also has the advantage enhancing usability and functionality, considering its lightweight characteristics. You don't need any significant upper body strength to use the hacksaw. It is lightweight and compact and fits snugly into the vast majority of adult hands. The handle, on the other hand, spots an ergonomic construction and is rubberized to guarantee a smooth and stress-free operation. To get a little technical, the blade has a length of 12-inches and is bi-metallic. Additionally, it comes with 32 teeth per inch (TPI) throughout its 12-inch length, allowing it to power effortlessly and quickly but accurately through the toughest and hardest materials a craftsman can have in their workshop. One feature that dramatically improves the performance of the hacksaw is the ergonomically designed, strategically placed and easy to use tension adjustment knob just below the handle. By using the knob, you can easily vary the tension of the blade to a point, or pound per square inch, that you find most suitable for the cut or material. So effective is the performance of the hacksaw that ardent users compare it to cutting through a piece of cake with a hot knife. The performance is, in a word, effortless. In a nutshell, the Park Tool has the best of all worlds. It comes in a lightweight and slim profile that's durable and sturdily constructed to last several years with proper use. Also, the sharp blade and the comfortable handle together augment the cutting prowess of the hacksaw, making it a pleasure to work with. More importantly, because the blade has 32 TPI, it takes the effort and time out of working with any material, which makes it one of the ideal hacksaws to use for woodworking and metalworking, among several other applications. It's very indicative that the Stanley STHT20139L is the second hacksaw from Stanley to feature on the list of best hacksaws. There isn't much difference in the way of its performance, durability, practicality, and usability from its bigger sibling but it does have its own distinct features that make it stand out in a fiercely competitive field. These include an adjustable blade, ergonomic design of the machine's handles, the durable construction using high-end materials, its lightweight and compact profile, and the fact that you don't have to break the bank to afford it. In the next paragraphs, we'll be taking an in-depth look at the Stanley Hacksaw 24 Tpi 12 “ to give you a better picture of its performance and the convenience of using it to help you put things in perspective before deciding on the most suitable hacksaw to reward yourself. One of the many strengths is its budget-friendly price tag. You don't have to break the bank to buy an expensive hacksaw for occasional use around the house or in the workshop as this one just suffices. It is, therefore, a solid choice for the weekend warrior or the enthusiastic Do-It-Yourselfer who is just getting started with metal, plastic and wood cutting and needs to horn their skills before moving on to a better hacksaw. That's not to say, however, that its construction quality does not make it ideal for undertaking heavy-duty cutting and sawing projects both at both and on a commercial scale. In fact, the build quality of the hacksaw happens to be one of the best in the industry. The use of steel to make the frame means the Stanley Hacksaw can withstand tear and wear and take on more challenging and demanding projects without hesitating or breaking a sweat, figuratively, of course. Meaning that you can use it on a multitude of materials, from the thickest and toughest blocks of steel to the lightest stocks of wood and plastics. Coupled with the moderate heat resistance of the blade, the user will be in for one of the most effortless, quick and precise sawing experiences ever. As you would expect, the main construction material is sturdy but also lightweight and compact and was specifically handpicked to ensure ease of use and at the same time, durability. It won't burden your hands with too much weight or be overly difficult to control or manoeuvre when trying to reach tight or awkward spots. To this add the aforementioned ergonomic design of the handle. The days of limiting your usage of a hacksaw to not risk straining your hands or have blisters all over them are long gone. The rubber grip on the handle ensures you have a firm and secure grasp to minimise the possibility of the machine slipping from your hand and to guarantee it fits perfectly and comfortable, thereby allowing for extensive and heavy use on a material of your choice. Now, on to the blade. Just like the frame, the blade features a rugged and long-lasting construction quality, the kind that can last for a considerable period with proper use. While it lacks the sharpness of top-end models, it nonetheless boasts exceptional edge retention capabilities and can effortlessly do the heavy lifting if the user subjects it to heavy use. The blade is also adjustable to between 90 and 180 degrees with a corresponding tension of up to 225 pounds. Couple that with the standard blade length of 12 inches and 24 teeth per inch and a throat depth of 4-3/8-inches and you have yourself something to use for cutting those thick piles of wood and plastic and metals. Cutting or sawing has never been easier, more accurate and quick as it is with the Stanley. Overall, it is deserving of its 9th position on the list of best hacksaw on the market currently. Aside from its flawless execution of the job at hand, the machine also features a durable and rugged that will easily withstand heavy use in all sorts of settings. Plus, the slim and lightweight profile of the hacksaw increases ease of use and comfortability for those who'll be working for long hours at a time. The best part is that the hacksaw is cheaply priced and will be an ideal choice for those working on a budget. There is just so much to love about our number 10 pick on the list of the best hacksaws on the market. The blade, for instance, is specifically for sawing the most abrasive and tough materials that will be crossing your desk in the workshop, construction site or even at home, in the case of enthusiastic Do-It-Yourselfers. 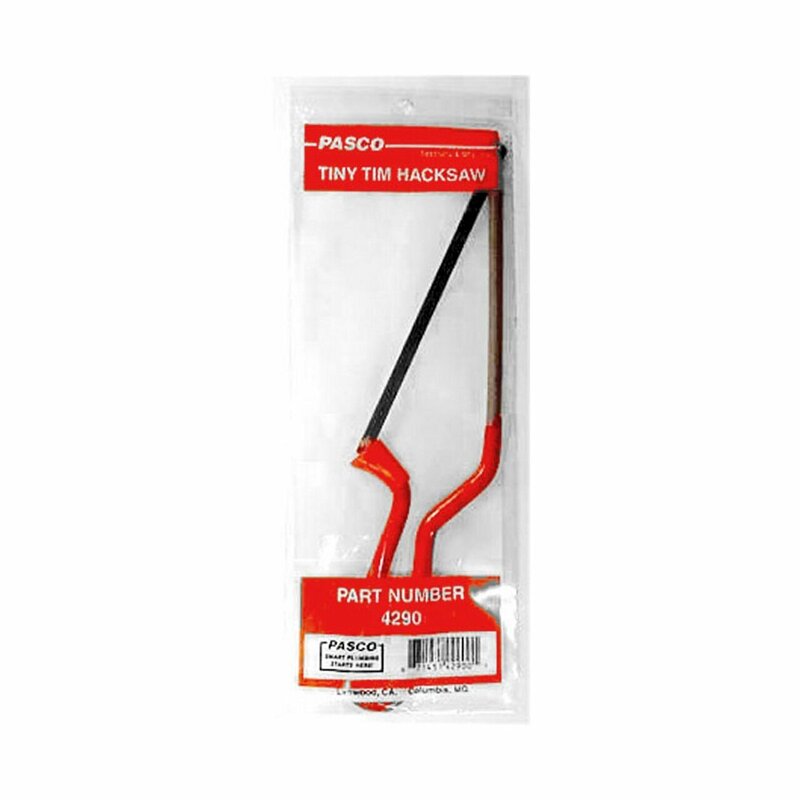 While the durability of the blade is remarkable, it is worth noting, from the onset, that the design of the Pasco 4290 Tiny Tim Hacksaw does not allow for adjusting the angle of the blade. The hacksaw, however, compensates for the absence of the convenience feature by coming in an outstandingly slim and lightweight profile that allows for effortless and quick use in tight and awkward spaces around the workshop. For an in-depth review of the hacksaw, continue reading. The design and construction explicitly aimed at giving the user quick and easy access to confined and tight spaces that would otherwise be out of reach if they were using full-size hacksaws. With a weight of just one pound and dimensions of 10-inches by 0.5-inches by 3-inches, using the hacksaw in tight spots is a cinch. You simply be applying a little effort to get the teeth to cut easily through steel and brass. 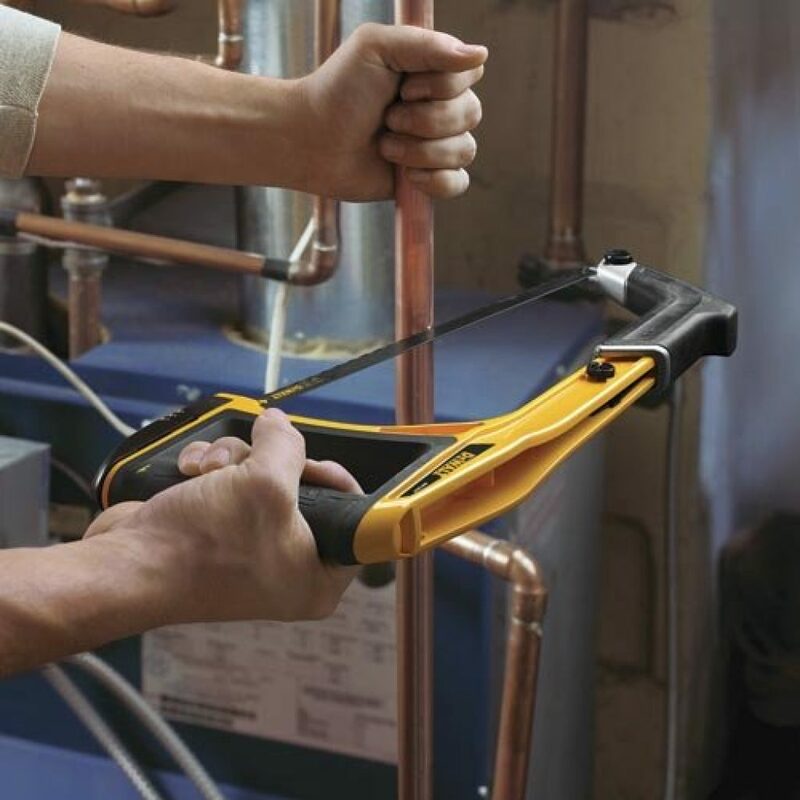 Its prowess at cutting or slicing objects in hard-to-reach places makes it a great choice for plumbers who want to resolve a few plumbing problems. Even though it's rated for use with tough materials like steel and brass, the blade only measures 6 inches in length, meaning that it is not ideal for use on heavy projects. It compensates for the small blade length and lack of the blade adjustment feature by offering the user superior cutting or sawing capabilities. Because it is slim and lightweight, all you have to do to cut in tight places is just to turn it and stroke away. It's also portable enough to take with you to different work sites or cramped spaces. Previous and current users, however, point out that the blade loses its sharp edge rather too quickly when frequently used on the recommended abrasive materials: steel and brass. The process takes some months though, and during that time you can acquire more backup blades and just have them in waiting for the eventuality. But then again, the cost of the replacement blades or the Pasco 4290 itself is in no way prohibitive. For field work, it's recommended that you invest in a tool belt to help you bring with you the additional instruments you might need. Clearly, this hacksaw is a solid, industrial-duty hacksaw boasting remarkable ease of use, practicality, and usability. Plus, the construction quality of both the frame and the blade is top-notch, the latter quality making it ideal for slicing tough and hard materials like steel and brass. Couple that with the lightweight, slim and professional balancing of the whole tool and you have yourself one of the best hacksaws on the market for light and medium-duty sawing. In a nutshell, it indeed gives the user value for their money. Users planning on cutting abrasive materials like brass and steel need to settle for nothing less than a commensurately high-quality hacksaw that can stand the demands of the job. To this end, you have several options. There are models out there made from industrial-grade materials like aluminium alloy and steel while others feature an I-beam type of construction. Aside from increasing the durability of the hacksaw, the construction material also needs to be resistant to corrosive materials commonly found in a workshop setting. Compromising on quality can be an expensive mistake especially for heavy users of hacksaws as it will necessitate looking for a replacement every few months. On a similar note, you should between a fixed and adjustable hacksaw frame, keeping in mind that the latter is more flexible. While the former only accepts a specific blade length, the latter is compatible with various lengths. Irrespective of your preference, ensure the tool features sturdy metal construction. A second critical component of a hacksaw you need to pay attention to before committing your money is the quality of the blade. Unlike Do-It-Yourselfers and the weekend warriors, professional craftsmen need to a versatile hacksaw at their side all the time for working on a wide range of materials. One sure-fire way of ensuring flexibility is by investing in a machine that accepts various blade types and lengths for working with all the different materials in the workshop. A second vital consideration as far as blade quality is concerned is the construction quality. High-quality variations generally last for much longer even with heavy use, meaning that they have exceptional edge retention capabilities which also translates to far fewer replacement frequencies. Additionally, consider the TPI (teeth per inch) of the blade. Those with higher TPIs tend to cut quickly, accurately and with a neater finish than their low-quality counterparts. Lastly, blades with superior edge retention take the effort and time away from cutting different material pieces. Your choice should, of course, be determined by the toughness of the material you intend to cut. Manufacturers incorporate several features into their products aiming to make them easy to use and convenient to use, thus appealing to the vast majority of greenhorns and enthusiastic DIYers still learning their way around the machines. The features are both effort and time-saving and make for very smooth and trouble-free use. The features to look out for are the design of the handles, physical attributes, and blade-tensioning mechanism, among others. While some hacksaws come with one handle, others feature two, allowing for a two-handed operation for those projects where a little force is needed to get the job done. Whether you prefer a one-handed or two-handed operation, make sure the handle is comfort to hold for extended periods of time, so there is no likelihood of straining or suffering hand fatigue. It would be even more beneficial if the handle has a rubberized grip that you can grip firmly in different weather conditions. Q: I finally have my first hacksaw. What are some proven practices that can prolong its lifespan? A: Properly using your hacksaw is a sure way of significantly extending its useful life. There are other additional measures you can take to ensure the same. First, make a point of always choosing the right blade for the right job. Blades with coarse teeth speed up the project while those with finer teeth are ideal for use on thin metal pieces. Of course, before getting started on any sawing project, ensure your material is safely and firmly secured. Also, just apply a reasonable amount of pressure, not too much as to cause the blade to bend or too little that you spend the whole day working on just one piece. Lastly, thoroughly clean the hacksaw off all debris after every use, and hang it securely whenever you’re not using it. Q: How about safety measures to take when sawing? A: Like mentioned above, it is paramount that the material is secured safely and firmly first so that the chances of wobbling about are non-existent and secondly to ensure accuracy when cutting. Hang it in between uses. Also, as is the case before operating other machines, make a point of wearing protective gear like gloves and eye-protecting goggle, so the metal debris do not get in your eyes. It’s never going to be an easy decision to make for users keen on making a one-off purchase, especially for greenhorns who lack the first-hand experience and knowledge of hacksaws. That’s why we put together this informative buying guide to diligently walk you through the process, and help you make an informed choice. All the hacksaws featuring on our list are outstanding in all the crucial aspects. They feature the best quality of construction, boast exceptional performance, and are surprisingly easy to use. They are similarly reasonably priced and offer users the best value for their money.